The village is first mentioned in charters in 1271 with the name: Byk . The church had been built in the 12th century, so the village is even older. In 1461 the name of the village is Poss. Vinchefalwa Byk. The name corresponds the old Vinczlófalva-Bik, which is now called Felső-Bükk. In the 15th century there were three Bik villages. The Büki Family was the landowner. Their descendants are the Mankóbüki Horváth and the Felsőbüki Nagy families. Pál Felsőbüki Nagy was a famous member of the Hungarian House of Representatives in the 19th century. Another notable landowners were the Counts Cseszneky who bought Alsóbük in the 16th century. Bükfürdő - high-class refreshment, relaxation and recovery Medicinal Spa of Bük has become one of the best-known and most popular medical spas in Europe. 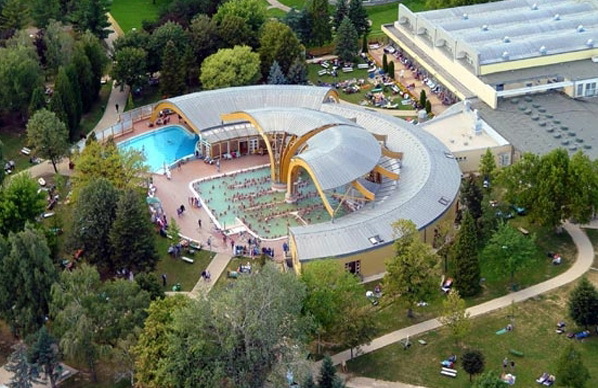 Nowadays it is the second largest spa of Hungary offering each generation perfect recreation. The spa located on 14 hectares is a real spa complex looking forward to your visit with 27 pools and a water surface of more than 5100 m2. pools that are to be used by them only, where they can be splashing about among safe circumstances. The slide complex free of charge leaves you with an experience never to be forgotten. After bathing, the children may play for a while on the state-of-the-art playground; the adults longing for relaxation are offered spacious retreats and comfortable deckchairs free of charge. In our Recreation Park-adventure bath you can recover the everyday weariness in a calm, quiet, green area. The roofed adventure bath in the Park open all the year round offers refreshment for each generation. Those fond of moving are awaited with sports grounds (beach volley-ball, beach handball, foot-tennis, badminton, beach football streetball, table tennis), and organised sports and entertaining programmes all the year round. Those responsive to culinary pleasures can also find everything in Bükfürdő that fit for a king: several restaurants and snack-bars wait for them. The Birdland Golf & Spa Resort (former Radisson) is a must for everybody emphasizing on the balance of his body and soul and stands out by providing unique services, tailor-made to our guests´ needs and concentrating on up to date health requirements. Its 207 elegantly furnished rooms and suites offer all services expected from a 5 star property. Start your day by gaining energy through the rich and healthy buffet breakfast, providing you amongst others with a diabetes food corner and freshly squeezed fruit juices. Keep on enjoying our exclusive beauty treatments with luxury cosmetic products, when Ayurvedic and Thai massages touch all your senses and perceptibly enhance your well-being. Purely relax in our 3500m2 spa and sauna world providing 6 pools (including 2 thermal water pools), 8 assorted saunas as well sunbathing and state of the art fitness possibilities. In addition our guests may take advantage of medical consultations concerning preventative rheumatology (including examination and treatments), Traditional Chinese Medicine (plus treatments) as well as plastic surgery. Our newly arranged animation program conducted by personal trainers will be subordinated to your individual medical needs. After your successful day know the full promise of a delicious dinner in one of our 2 restaurants. Choose between traditional Hungarian specialty menus and international cuisine in buffet style, serving also slimming and low calorie dishes as well as food accounting for diabetes and food allergies. End your day with a visit in our cozy Piano Bar and enjoy a wide selection of tea, coffee and chocolate specialties, exclusive wines as well as vitamin shakes.